Introduction: Chronic suppurative otitis media (CSOM) is a long standing infection of middle ear cleft having a permanent perforation in the tympanic membrane with or without discharge. This is of two types; tubotympanic and atticoantral disease. Tubotympanic type of CSOM is called safe type, because the rate of complication is very low and usually not associated with cholesteatoma. Ossicular chain involvement is found in both safe and unsafe type of disease. In safe type though the involvement of ossicular chain is less common, still significant numbers of patients are having hearing deterioration due to it. Materials and Methods: Present study has been conducted in the Department of Ear, Nose, and Throat (ENT), Alluri Sitarama Raju Academy of Medical Science, Eluru, AP (India). Study group includes 200 patients having safe type of CSOM selected from ENT outpatient department (OPD). Preoperatively, all patients were evaluated to identify ossicular involvement. Then they were evaluated per operatively for confirmation of preoperative findings under microscope. Results: It was found that 74 patients out of 200 are having some amount of ossicular involvement in the form of ossicular necrosis, ossicular tympanosclerosis, or ossicular fibrosis, that is, 37% cases. Thirty-eight patients are having ossicular necrosis, that is, 19% cases. Conclusion: So our study shows that in safe type of CSOM, approximately one-third patients are having some amount of ossicular involvement and one-fifth patients are having ossicular necrosis. So as an ENT surgeon, we should be competent enough to do the ossicular chain reconstruction during surgery to give the best hearing results to our patients. CSOM is usually classified into two main groups; tubotympanic and atticoantral disease. Tubotympanic type of CSOM is called safe type, because the rate of complication is very low and is usually not associated with cholesteatoma formation. Ossicular chain involvement is found in both safe and unsafe type of disease. In safe type, though the involvement of ossicular chain is less common, still significant numbers of patients are having hearing deterioration due to it. Central perforations are considered to be safe, as cholesteatoma is usually not associated with them. Central perforations may be anterior, posterior, inferior (in respect to handle of malleus), and subtotal. Again central perforation may be dry or active, giving history of intermittent profuse mucoid discharge. Rarely, the discharge is continuous and malodorous. Discharge is precipitated by passage of water through perforation and upper respiratory tract infection. The diseases usually found in active central perforations are granulation tissue and polyp formation. Ossicular chain fixation or erosion may be found in both active and dry central perforations. This study has been conducted over a period of 3 years (from June 2010 to May 2013) in the Department of Ear, Nose, and Throat (ENT) and Head and Neck Surgery, Alluri Sitarama Raju Academy of Medical Sciences, Eluru, AP (India). Total patients studied during the period were 200 out of which 120 were males and 80 were females. Hearing loss in relation to ossicular defects. Patient willing to come for regular follow-up and obey the medical advice. Patients with CSOM coming to ENT OPD were evaluated properly with detail history taking, thorough clinical examination by otoscopy, and examination under microscope. Patients with safe type of perforations were selected for the present study. Hearing assessment by pure tone audiometry, X-ray of both mastoids, tests for Eustachian tube More Detailss function where also done routinely in all the cases. CT scans were done in some selected cases to exclude middle ear and mastoid pathology, mainly to identify cholesteatoma, assess the ossicular chain status, and status of the facial canal and semicircular canals. Patients with dry central perforations in tympanic membranes which were dry since more than 3 months, with normal Eustachian tube function were offered only tympanoplasty despite of status of mastoid air cell system on X-ray. Patients with dry central perforations for more than 3 months where Eustachian tubes are nonfunctional and not improving with medical treatment, usually we preferred cortical mastoidectomy with tympanoplasty despite of status of mastoid air cell systems. In patients with intermittently or continuously discharging ears despite of medical treatment, we choose proper antibiotics by culture and sensitivity test and preferred to do cortical mastoidectomy and tympanoplasty as one-stage procedure. Patients with hearing loss due to ossicular chain defects were offered ossiculoplasty. Depending upon the types of ossicular chain defect, different types of ossiculoplasties were done. All the patients were evaluated under microscope during surgery to confirm the preoperative findings. Out of 200 patients studied, 120 were male and 80 were female. All the patients were in the range of 10-60 years of age. Maximum number of patients was in the age group of 20-30 years, that is, 64. Minimum number of patients was in the age group of 50-60 years, that is, 20. Youngest patient in our series is 13 year and oldest is 59 year. Out of 200 patients studied, 126 patients were having normal ossicular chain, that is, 63%. Rest 74 cases were having some amount of ossicular pathology, that is, 37%. These patients with ossicular pathology were classified into three categories: Ossicular necrosis was found in 38 cases, ossicular fibrosis in 11 cases, and tympanosclerosis of the ossicles in 25 cases. Ossicular involvement was found more commonly in patient with subtotal perforations in comparison to central perforations [Table 1]. Out of 74 patients with ossicular involvement, 56 patients were having subtotal perforation and 18 were having central perforations. Out of 38 patients with ossicular necrosis, 30 cases were associated with subtotal perforation and 8 were associated with central perforation. Like that, 20 tympanosclerosis cases were associated with subtotal perforation and five were with central type. Six cases of ossicular fibrosis were associated with subtotal perforation and five cases with central perforation. Out of 38 patients with ossicular necrosis, commonest ossicle involved was the long process of incus. Isolated long process of incus involvement was found in 17 cases (44.7%). Both long process of incus and stapes superstructure involvement was found in seven cases (18.4%) and both long process of incus and malleus handle involvement was found in five cases (13.2%). Isolated lenticular process of incus involvement was found in four cases (10.5%), isolated malleus handle involvement was found in two cases (5.3%), and all the ossicles were involved in three cases (7.9%). In the present study, hearing loss associated with different types of ossicular defects were evaluated [Table 2]. Long process of incus was associated with maximum number of cases, that is, 17 and average hearing loss was 50.2 dB. Next group was having involvement of long process of incus and super structure of stapes, that is, seven cases and hearing loss was 57.1 dB. Average hearing loss was maximum when all the three ossicles were absent, that is, 58.4 dB (three patients). Hearing loss was minimum with isolated malleus handle involvement, that is, 45 dB (two patients). So, from the present study it was found that ossicular chain involvement was there approximately in every third patient of safe type CSOM and ossicular necrosis in every fifth patients [Figure 1]. Berthold (1878), in Germany, had successfully repaired the tympanic membrane with full thickness skin graft and called the operation "myringoplastik". In 1953, Zeiss operating microscope was commercially available and became a landmark in the history of otologic surgery. Mathur et al., (1991) observed eroded incus in 22% of cases. Quarranta et al., (1995) noted the prevalence of eroded incus in 27% cases. In our series, involvement of incus present was in 44.7% cases. In 1971, Austin classified ossicular chain defects into four categories depending upon presence or absence of malleus handle and the presence or absence of stapes superstructure. When both malleus handle and stapes superstructure were present, malleus/stapes assembly was done. When malleus handle was present and stapes superstructure was absent, malleus/footplate assembly was done. When malleus handle was absent, membrane-to-stapes head interposition was done in presence of stapes superstructure and membrane-to-footplate interposition was done in absence of stapes superstructure. We followed the same methods in our study. Swan et al., described that the most common pathology in the middle ear is erosion of the long process of incus. This is reasonably straight forward to correct surgically. Preferred option is to place prosthesis between handle of malleus and head of stapes. When the stapes superstructure is also missing, malleus handle has to be connected to the stapes footplate and autograft materials are rarely suitable. Occasionally, there is also erosion of the malleus handle, here the prosthesis connects the tympanic membrane directly to the stapes superstructure or footplate. Homograft materials are not recommended because of the theoretical risk of transferring prion disease. For most of the cases in our study we used autograft, that is, processed incus, malleus or cortical bone and some cases with teflon partial ossicular replacement prosthesis and total ossicular replacement prosthesis. Some cases in our series were having absence of foot plate of stapes. In those cases footplate was reconstructed by using conchal cartilage and then membrane-to-neo footplate interposition done using processed incus/malleus/cortical bone. In our series, we followed our own protocol for mastoidectomy, that is, patients with dry central perforations in tympanic membranes which were dry for more than 3 months, with normal Eustachian tube function were offered only tympanoplasty despite of status of mastoid air cell system on X-ray. Patients with dry central perforations for more than 3 months where Eustachian tubes are nonfunctional, not improving with medical treatment, and with bilateral ear diseases, usually we preferred cortical mastoidectomy with tympanoplasty despite of status of mastoid air cell systems. In patients with intermittently or continuously discharging ears despite of medical treatment, we choose proper antibiotics by culture and sensitivity test and preferred to do cortical mastoidectomy and tympanoplasty as one stage procedure. In our study we found that in 37% cases there were ossicular chain involvement in safe type of CSOM. Ossicular chain involvement was in the form of ossicular necrosis, ossicular tympanosclerosis, and ossicular fibrosis. Only ossicular necrosis was found in 19% cases. Ossicular involvement was more common in subtotal perforations in comparison to central perforations. Involvement of long process of incus was associated with maximum number of cases and average hearing loss was 50.2 dB. Average hearing loss was maximum when all the three ossicles were absent, that is, 58.4 dB. Hearing loss was minimum with isolated malleus handle involvement, that is, 45 dB. So our study shows that in safe type of CSOM, approximately one-third patients are having some amount of ossicular involvement and one-fifth patients are having ossicular necrosis. So as an ENT surgeon, we should have enough competencies to do all types of ossicular chain reconstructions during surgery to give the best hearing results to our patients and providing a better productive life. 1. Shrikrishna BH, Ossicular defects in patients with non cholesteatomatous CSOM, OJ Otol HNS 2010;4:14-7. 2. Varshney S, Nangia A, Bist SS, Singh RK, Gupta N, Bhagat S. Ossicular chain status in chronic suppurative otitis media in adults. Indian J Otolarymqol Head Neck Surq 2010;62;621. 3. In: Frootko NJ, editor. Reconstruction of middle ear, Scott-Brown′s Otolaryngology, 6 th ed. Oxford: Butterworth-Heinemann 1997; 3:11:2-3. 4. Mathur NN, Kakar P, Sing T, Sawhney KL. Ossicular pathology in unsafe chronic suppurative otitis media. Indian J Otolaryngol 1991;43:9-12. 5. Quaranta A, Bartoli R, Lozupon E, Resta L, Luranto S. Cholesteatoma in children. Histopathologic findings in middle ear ossicles. J Otolaryngol Relat Spec 1995;57:296-8. 6. Thomsen J, Bretlau P, Jorgensen MB. 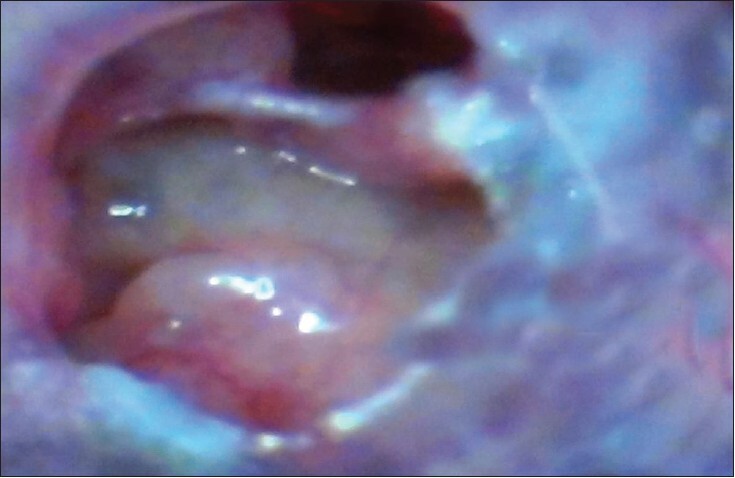 Bone resorption in chronic otitis media: The role of cholesteatoma, a must or an adjunct. Clin Otolaryngol 1981;6:179. 7. In: Cummings, editor. Otolaryngology. Head and Neck Surgery. 4 th ed. Philadelphia: Mosby Inc; 2005. p. 2997-9. 8. In: Frootko NJ, Reconstruction of middle ear. Scott-Brown′s Otolaryngology, 6 th ed. Oxford: Butterworth- Heinemann 1997;3:11:10-4. 9. Swan IR, Canter R, William McK. Chronic otitis media. Scott-Brown′s Otolaryngology, Head and neck surgery, 7 th ed., vol. 3. London: Edward Arnold (publisher′s) ltd, Michael Gleeson editor; 2008. p. 3420-3. 10. Merchant SN. Chronic otitis media, Scott-Brown′s Otolaryngology, Head and Neck Surgery, 7 th ed., vol. 3. London: Edward Arnold (publisher′s) ltd, Michael Gleeson editor; 2008. p. 3396-9.